In his powerful new program, Get The Edge�, Tony Robbins delivers to you the best of what he has learned and the proven strategies that can help virtually anyone achieve anything they desire � and experience amazing levels of personal fulfillment in the process. 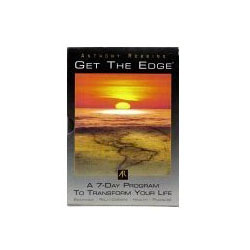 With your help we can reach more people and let them know about Anthony Robbins - Get the Edge whether this product works or not. I've listened to several of Tony Robbins's programs, and have heard the contents of this package. They are excellent motivational programs. Over the years, his materials have been packaged separately or in combination, but have always been outstanding. Of course, there is no "magic" here. It requires the listener to take Tony's advice and ideas, and actually get off the couch and DO something, and certainly there are many who hope that simply listening to the recordings will cause miraculous changes to occur in their lives. But taking his advice, assimilating it, and WORKING to achieve improvements in your life (just as any worthwhile accomplishments require actual work, and not just wishful thinking), will surely bring results. While some listeners may prefer the more sedate and measured presentations of an Earl Nightingale or a Brian Tracy, those who relate to Tony's more energetic, "rah rah" approach -- AND ARE WILLING TO DO THE WORK TO MAKE THE CHANGES -- will find his program(s) a worthwhile investment. This book is amazing, definitely food for thought. It has greatly inspire me to change my world. He uses alot of examples in his courses and backs up with some interesting scientific facts. I can't wait to read more of his books.